Microsoft recently teamed with Harvard Business Review for a study that delves into how digital technology affects first line workers across industries. They define first line workers as “employees who are the first point of contact between organizations and their customers or who spend most of their time making products or managing operations.” The tasks these workers are doing is widely varied, and their specific business unit results are a direct effect from how well their company equipped them with technology. In the study, researchers found that first line workers who were customer-facing were digitally better equipped than their non-customer-facing counterparts. These were employees who, as part of their job, directly interacted with customers – the “first point of contact” portion of the earlier definition. While it is well-known that equipping workers is very important, gathering the resources to do it effectively can be a major bottleneck. Cost can be prohibitive. For workers who don’t directly interact with customers, we see that cash-strapped companies may not see the value of investing in workers outside of those in the first lines. Often, people think improving technology means replacing people. This is a false idea. Business units should never make a binary choice between workers or technology. More value can be gained from utilizing the correct technology to support your employees in doing their work. There are many hidden advantages to equipping your employees, instead of supplanting them. One of these major advantages is the correlation between digital technology and employee skill development programs. The study delved into the connection between companies who were both digitally well-equipped and had an emphasis on employee training. 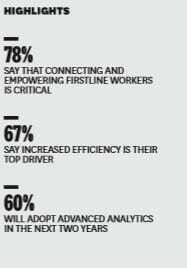 Formal training programs were much more prevalent in more digitally oriented organizations. But there is an additional benefit: employee empowerment. Organizations that effectively use technology to support their employees generally have employees who are better motivated and take more pride in their work. The study describes how “Digitally enabling first-line workers also empowers them to be more engaged in innovation work, allows efficiencies to be tracked automatically, and reduces duplication of tasks.” The opportunity cost of not empowering your employees is high in terms of turnover, productivity, and overall morale. This Microsoft-Harvard survey underscores that deploying technology effectively in your organization should start with your first-line workers. Cultivating the correct mix of personnel and technology is vital to get the most out of your IT budget. For help in choosing, deploying, and operating any new tech projects, reach out to experts who can tailor the tech to your specific goals. Peters & Associates does this every day – call us at 630.832.0075 or email info@peters.com. We are happy to help!